Kyudo: the way of traditional Japanese archery. Simply put, it is the action of using a bow to shoot an arrow at a target. And yet at another glance, there is much much more. Kyudo (more accurately spelled “kyuudou”) is a particular style of archery in which shooting an arrow to hit a physical target is just a part. This is largely where the practice of kyudo begins, and is up to each archer to answer on his own. Aside from shooting an arrow, one could generally summarize the other facets as etiquette. This includes the particular manner in which the shooting is done, the preparatory movements to shooting, the method in which one enters and leaves the shooting area, the cooperation between archers in shooting, the maintenance of equipment, the dress one wears during practice, etc. But this is just the physical side, which is only just another small part of the whole of kyudo. What of the deeper mental and spiritual aspects? Why is it important to call it “Japanese”? It is the last character of this word that further reveals the spiritual and mental sides of kyudo. The suffix “-dou” denotes a family of traditions in Japan in which the practice at hand is not merely physical movements for a specific aim, but a way of living and expressing oneself. This “way” is a method of self-cultivation and its manifestation is art. which is why one would go to a lot of trouble to say it is more than just shooting an arrow at a target. shooting an arrow at a target. Welcome to the labrynth that is kyudo. Below I have left two very important writings on the practice of kyudo: the Raiki-Shagi (Record of Etiquette-Truth of Shooting) and the Shaho-Kun (Principles of Shooting). They are fairly brief, but within these writings we can discover as well as return to the source of kyudo. The shooting, with the round of moving forward or backward can never be without courtesy and propriety (Rei). After having acquired the right inner intention and correctness in the outward appearance, the bow and arrow can be handled resolutely. To shoot in this way is to perform the shooting with success, and through this shooting virtue will be evident. Kyudo is the way of perfect virtue. In the shooting, one must search for rightness in oneself. With the rightness of self, shooting can be realized. At the time when shooting fails, there should be no resentment towards those who win. On the contrary, this is an occasion to search for oneself. The way is not with the bow, but with the bone, which is of the greatest importance in shooting. Placing Spirit (Kokoro) in the centre of the whole body, with two-thirds of the Yunde (left arm) push the string, and with one-third of the Mete (right arm) pull the bow. Spirit settled, this becomes harmonious unity. From the centre line of the chest, divide the left and right equally into the release. It is written, that the collision of iron and stone will release sudden sparks; and thus there is the golden body, shining white, and the half moon positioned in the west. 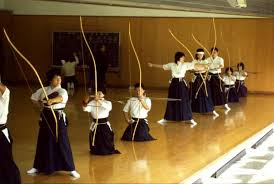 What is the bes way to find a Kyudo school in Japan? I live in Kanagawa, and everything around here is either: Study by yourself (no instructors) OR study 1x a month at 2pm on a tuesday for 50 minutes. Yo Mike B. Wow! Being in Kanagawa I imagine there are lots of opportunities around, and excellent teachers, I would DEFINITELY say both studying by yourself and once a month for 50 minutes are really really really bad ideas. But I’ll tell you what you should do if you really want to give kyudo a try: find a dojo close to home and go in person to check it out and say that you want to give kyudo a try, and ask if there is a class (kyoushitsu, 教室) starting any time soon. When I first started kyudo it was with a kyoushitsu where we went two days a week, two hours at a time, for two months. In the dojo I currently practice in they have one for three months. They seem to be offered once or twice a year at dojos that do it. If the dojo you go to doesn’t have one, then ask for one that does. If you’re polite and nice I can guarantee the kyudo people you talk to will match that and be super helpful and happy to get you started. In such a class you will be instructed from the very beginning on ettiquite, equipment, beginning practicing, and eventually get to a target. As a warning though, kyudo isn’t something to pick up and put down very easily. Of course if you want to see it, give it a try, don’t like it, and quit, that’s fine … but getting started in kyudo can be a particularly slow process, which requires a lot of time and effort from you and even more so the people that will help you. If you decide to begin, do so with determination, do your best to do exactly what you’re told, and be ready for challenge. Again, I’ll reiterate, studying by yourself especially as a beginner is a REALLY REALLY bad idea, in fact it makes my head want to explode. Though you pull the bow on your own, kyudo is very much a group endeavor where you work with your teachers and peers. Also, only once a month is far too small for anything to happen. So yeah, please don’t hesitate to contact me with further questions, I’m more than happy to talk. If you want to give it a try, find a local dojo and ask about a class.